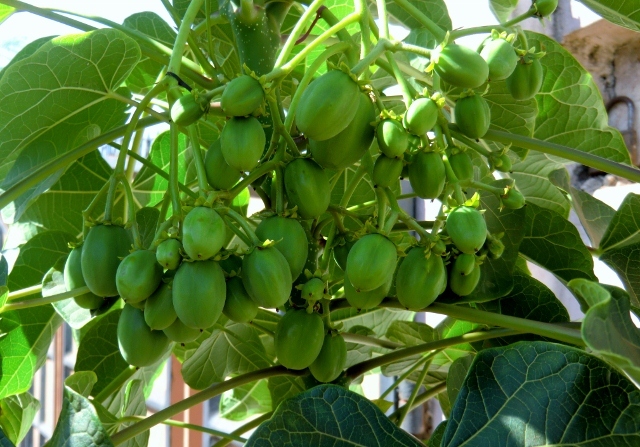 Articles about intraspecific Jatropha curcas hybrids. 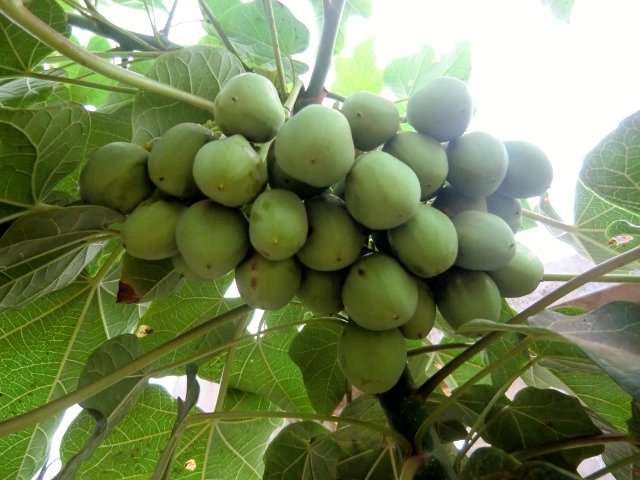 We are currently observing another impressive result of hybrid vigor in our Jatropha Breeding Program: a six months old hybrid exhibits the first fruit cluster with exactly 50 healthy fruits. The seedling germinated on March 17 (my birthday :-)) and has reached a height of more than 2.5 meters by now. Manual pollination has been conducted 10 days ago. Among other this hybrid also shows a distinctively superior tolerance to drought stress than both parents. As usual drought tolerance goes together with relative (horizontal) pest resistance. 2 sister plants of the identical hybrid which had germinated in the same week are showing similar impressive fruit counts for their first clusters: 35 and 42 respectively. We weighed 15 freshly harvested seeds at a total of 18 grams. This converts into a 100-seed weight of 120g. That’s a new record in our breeding program. male parent (top right): 45g. It will be interesting what we are going to see in the next generations of hybrid crosses. The plant has already been crossed with most of our high quality accessions and also back crossing with both parents has begun. We will definitely report again in the future. This entry was posted in Breeding, Heterosis, Intraspecific hybrids and tagged fruits per cluster, heterosis, high seed weight, hybrid vigor, Jatropha breeding, superior cultivar on November 3, 2012 by Ulrich Riemann. 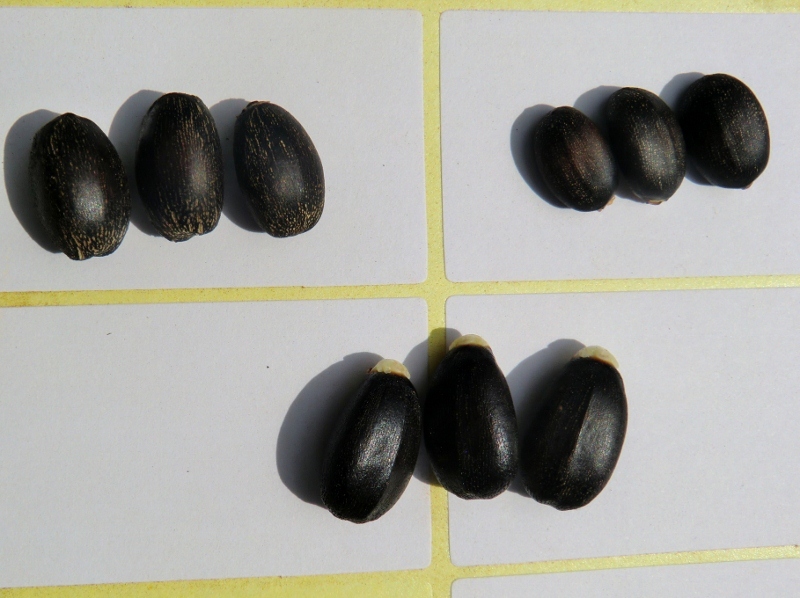 We have harvested a first batch of Jatropha seeds from the intraspecific hybrid exhibiting by far the strongest heterosis effects in leave size and height. And we were up for a real surprise. 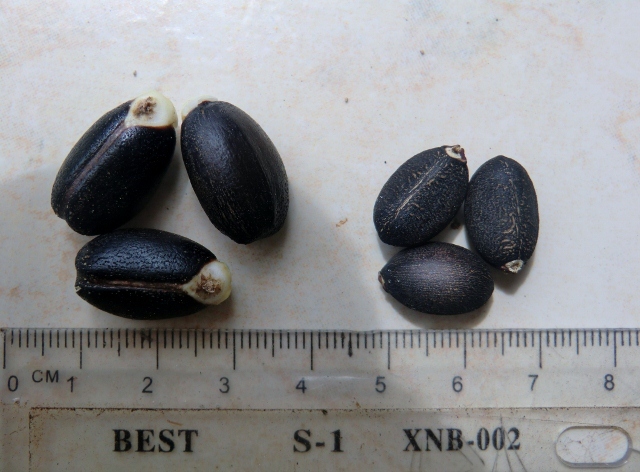 We had recently seen 2 scientific reports on heterosis trials with Jatropha in South East Asia describing maximum positive heterosis in seed weight of up to 25%. We therefore never expected to see our highest 100-seed weight increasing so much. Extrapolated from 20 harvested seeds it slightly exceeds 110g. Size can be compared well in the picture above with control being a typical average size seed at a 100-seed weight of 56g. Our own findings are completely in line with the above mentioned reports, while showing even further potential. We still have to cross those parental lines in our possession with the greatest distance according to our genetic map. 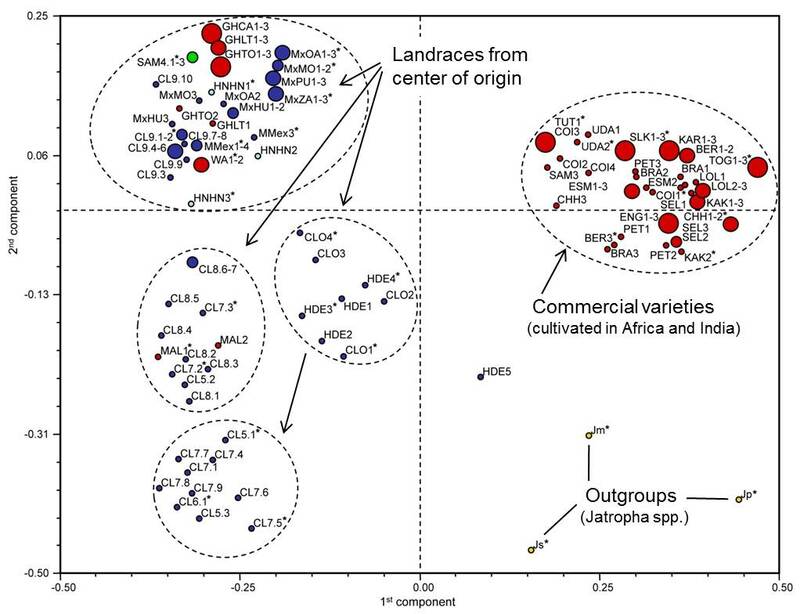 As all available results point to the very strong positive correlation between heterozygosity and heterosis in intraspecific Jatropha hybrids we expect that our latest findings can easily be exceeded once all our planned hybrid crosses have fruited. This latest success supports our ongoing planning for a dedicated heterosis breeding sub-program which could allow for stable, highly superior F1 hybrids within less than 2 years. This entry was posted in Breeding, Breeding program, Genetics, Heterosis, Intraspecific hybrids, News and tagged breeding milestone, heterosis, heterozygosity, high seed weight, hybrid vigor, seed yield on September 30, 2012 by Ulrich Riemann. What exactly makes a certain Jatropha accession an elite cultivar? You can find the term everywhere but a clear definition is usually not given. Therefore I want to explore this subject today and attempt to demonstrate how an answer translates into the daily work of a Jatropha breeder. The term itself is simple: elite means something like “better than average” and cultivar is just an abbreviation of “cultivated variety”. But what does it really mean to us? The most general and holistic objective when breeding for an improved commercial crop is of course always maximum profitability for the farmer. As this is self explanatory only a next level break down of objectives can offer some insight. In our program we use 4 groups of traits which in turn again break down into the real, identifiable traits when observing a selected plant. We are looking for improved traits in all of the above groups. Let’s have a quick look at each group to see some of the aspects a breeder is really looking for every day. For us this includes several individual traits, all linking back to profitability of the crop of course. Chemical composition of oil and cake. No further explanations needed here I think. This is the most relevant for most people discussing Jatropha, but what are we really talking about, when we use the term? Many people would just want to count the seeds or go by tons per ha. An approach that would translate into something like number of seeds harvested per plant per year. This again translates into bottom line traits like branching (self or pruning induced), number of fruit clusters or fluorescences per branch, number of fruits per cluster (= number of total flowers in a fluorescence plus male:female flower ratio). Not too difficult to understand, once you know the Jatropha exclusively flowers at the top of a branch. However, that’s not even half the truth. In our understanding the high level measurement must actually be average amount of crude oil obtained per ha (or acre) combined with average amount of cake per ha. 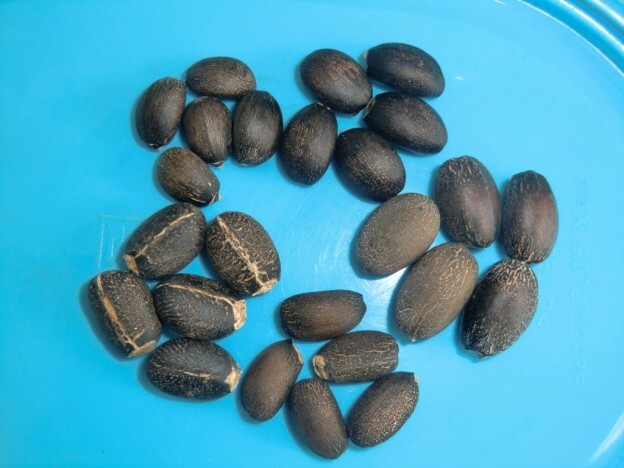 The typical measurement 100 seed weight varies from around 45g to 98g in our current accessions and oil content ranges from 25% to clearly over 50%. That means with an equal number of seeds per ha I can actually have up to 4 times the oil! Lets move on to traits important for agronomic reasons. Many of them are related to the cost involved in farming Jatropha and the most to the ease of harvesting. There is the uniformity of fruit ripening which determines how many times a picker has to pass a plant per season, then there is canopy structure and size of fruit clusters which determine the ease and speed of harvesting. Other important agronomic traits are self branching (without the need of pruning). Also drought resistance or rather the reaction to water stress is an important trait. We find that there are tremendous differences between accessions. The difference is at what level of water stress a plant stops female flowers, no flowers at all, throws off developing fruits and more. We see a clear pattern of those reactions differing greatly among accessions. I also have to admit that so far the best performers are the weakest in terms of water stress resistance. I am aware that this review of relevant traits in Jatropha is anything but exhaustive, but I don’t want to bore my readers too much with the obvious. 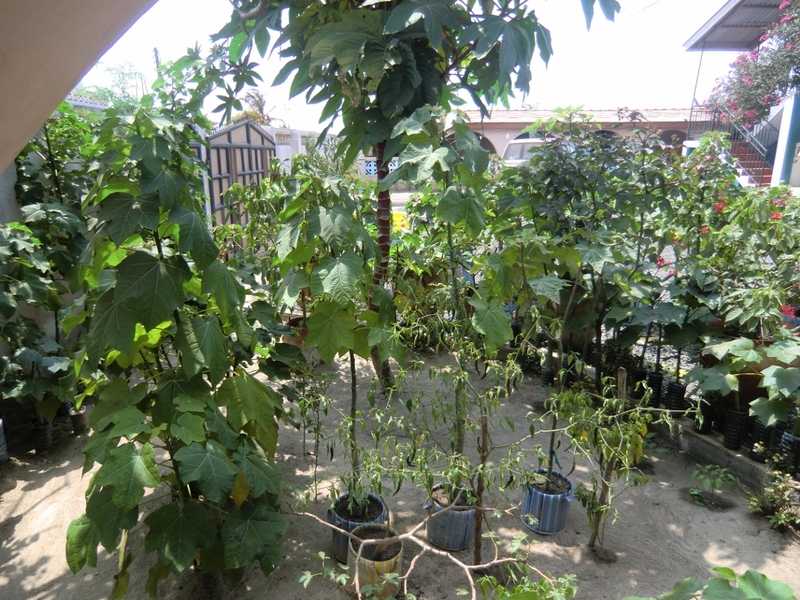 Therefore I tried to point out only a few of the less discussed but important aspects of this fundamental subject on the way to true Jatropha elite cultivars. 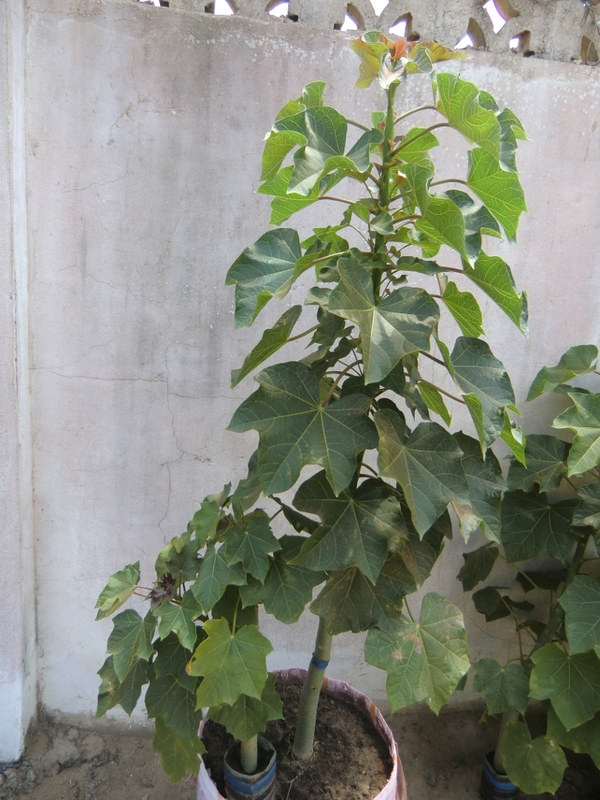 This entry was posted in Genetics, Interspecific hybrids, Intraspecific hybrids and tagged Jatropha breeding, preferred traits on September 8, 2012 by Ulrich Riemann.